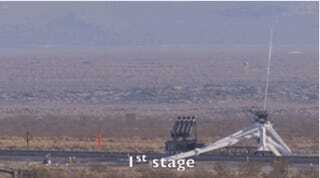 Watch a rocket sled attached to a parachute shoot through the desert! The folks over at JPL's Low Density Supersonic Decelerator project have been building a rocket sled — and here it is in action! In this video, scientists test out the rocket sled by attaching it to a parachute and shooting it onto a railroad track in middle of the desert — followed up, of course, by plenty of celebration in the control tower. And then they set the video of the whole thing to Metallica's Sandman, because, why not? Besides being awesome (and being a way more enjoyable music video than anything Metallica has produced yet), the rocket sled also has a scientific purpose: to ease future landings on Mars. The hope being that, after shooting 300 million miles through space, the rocket sled could play a key role in letting a spaceship survive the "six minutes of terror" in which the ship goes from flying through space at 1000 mph to sitting still on the face of a distant planet.